Alaina will assist you with all of your front office needs, from scheduling your appointment to helping you with your insurance forms. In March of 1962 Dr. Gilbert S. Smith Jr. DC. opened the Smith Chiropractic Office in Auburn and provided quality Chiropractic care for the whole family. Being a father of 5 and a chiropractor it was natural to provide spinal care for all of the members of the family to maintain optimal health. Dr. Gilbert Smith Jr. DC. practiced 45 years and passed on to his eternal home in 2007. In 1986 his eldest son Dr. Keith T. Smith DC. 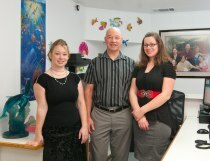 joined him as a licensed chiropractor to carry on the family practice and add to the family atmosphere. Dr. Keith is a father of 4 and feels it comes very natural to provide quality chiropractic care for the young and elderly alike. Today Dr. Keith Smith DC. continues to provide spinal care for the whole family. In 1995 Keith Smith DC. added to the Professional Care several Massage Therapist's for those that need assistance for the muscular part of the Musculoskeletal system. Massage Therapy is an opportunity for those in need to have either a relaxing pre-adjustment hour, or the often needed extra muscular therapeutic work given by the massage therapist after your chiropractor gives a spinal adjustment.